Mahabaleshwar is the largest hill station in the Sahyadri range of Maharashtra state. It is situated at an altitude of 1372 m above seal level in Satara district, about 115 km southwest of Pune. Due to its high altitude, the town has a cool climate and offers many pleasant walks. There are several lookout points which offer spectacular views of the surrounding hills and valleys. There is an old Shiva temple in the forest, which is the source of five rivers, including the Krishna river which is the second longest river of peninsular India.Its very good place to visit. Mahabaleshwar is visited by many thousands of tourists every year. It is well connected by bus with the important towns of the region. There are numerous hotels for every budget. The peak season is March-May; it rains very heavily from June to September. Mahabaleshwar is the best family weekend gateway from pune.Pune Airport is the nearest airport.Mahabaleshwar is the hill station in satara district of Maharasthara State. The Shiva Temple in old Mahabaleshwar is near the source of 5 rivers, and the water keeps flowing throughout the year. You can take a tourist bus (Volvo) from Mumbai, departing from Dadar East, Sion or Vashi. The ride will take you 6 hours and will cost around Rs 500. An ordinary AC bus will cost Rs 200. The Volvo bus from Pune is currently operated by two private companies (Neeta and Konduskar), and they charge approx Rs 250 each way. The Govt. Express bus from swargate starting 5.45AM and every hour with a moderate price of 120/- per individual. 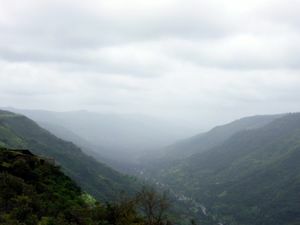 Mahabaleshwar is also accessible by road from Mumbai, about 247 km. It takes about 4 to 5 hours by car if taking a route via Panvel through Mahad and Poladpur. After the opening up of the Mumbai -Pune expressway and the highway onwards from Pune to Satara, this is the much better and preferred option to drive down from Mumbai.The distance via this route about 40 kms more but you reach much faster. You have to get off this highway at a place called Surur and then travel via Wai and Panchgani to Mahabaleshwar.The road is less winding than the other one via Poladpur but more easy as far as driving is concerned. You can also reach Satara by train from Mumbai/Banglore. Mahabaleshwar is 47 km from Satara and takes little more than one hour from there. Try to arrive here in the morning because most of the hotels have a check-in time of 9AM. If you arrive later you may have to wait until another room becomes vacant. A must see is a water well in the heart of market in the compound of the Library which is almost 150 years old. It still provides water to locals and is some 100 feet deep. 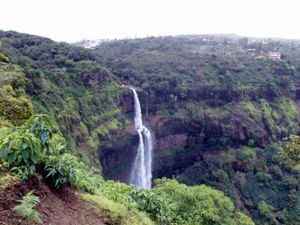 Pune to Mahabaleshwar distance is only 120km.If you are planning to visit mahabaleshwar and panchagani from pune city with friends and family then cab booking from pune airport to mahabaleshwar is the best option to visit mahabaleshwar.Mahabaleshwar and panchagani can be visited in 1 to 2 days. Mahabaleshwar is built on a plateau and getting around is quite easy. Taxis(Cabs) and buses leave from the center of town near Irani's petrol pump opposite the Club. Taxi/Cab drivers charge only 50 INR for ferrying at local places within or around New Mahabaleshwar.Taxi/Cab service for sight seeing or local ferrying is centrally regulated with the office opposite the gate to the Govt Bus Stand. The rates are all fixed per the Taxi Drivers association and as of Jan 2013, it is is Rs.450 for local sightseeing (Tours 1,2 and 3) and Rs.750 for Pratapgad and back. The main destinations are the "points", named after prominent British administrators who found these splendid locations with unbeatable views. The points are located at various edges of the plateau in different directions. Rental cars and taxis can get there quickly. For the more adventurous, horses are available in town and there are lovely shady bridle paths for delightful rides. The best way to get around is by bus which is provided by Govt. You can book ticket prior day only.Cost is around 80/- to 85/- per individual. Govt. Bus has two tour one is Pratapgad darshan in morning 9.15AM and Mahabaleshwar darshan in noon 2.15PM (4 hours covering 11 Points Arthur,Kate.., Strawberry farm and finally ending with Sunset , a Semi luxury bus 37 Seats , The driver speaks only in Marathi with some Hindi. During Offseason there is Only one Bus but during season 3 buses ply on this Darshan. Beware of Monkeys.) They are best. Understand that the taxi association has a rule against providing services for a single person. So, if you are a single traveler, you would have to go the police station and present a form of identification, provide contact details and answer questions as to the purpose of your visit. If they are convinced that you are not a miscreant or one who intends to commit suicide, they will give you permission to hire the taxi to go on the package tours. Typically five Sightseeing tours are conducted from Mahabaleshwar each of 2-3 Hr duration and costing between INR 350-550 (January 2010). The Bazaar is in the center of town and consists of a pedestrian-only street with shops selling everything from fancy locally-made walking sticks to snacks and the specialty of the region - roasted chickpea nuts. At the far end of the bazaar stands a Mahabaleshwar institution, Imperial Stores, owned and run by generations of the Irani family. Here you can get anything from videos to provisions to ice cream to beer. Strawberries, Mulberries and carrots are the speciality of Mahabaleshwar. One should not forget to try the Corn grown locally available in both roasted and boiled form. Corn pattice made from it is delicious. The food prepared with local vegetables has a unique taste and one should also try the small tomatoes which look like cherries! Dont forget to have the staple food of Maharashtara the Vada Pav which is deliciously prepared by the local vendor next to the Hanuman Temple in the main market. Almost all the hotels have their own restaurants. Hotel DreamLand, Hotel Panaroma & Hotel Shreyas have a nice restaurant and good food, and all three are close to the State Bus stand. Many hotels, like Hotel Regal, Bharat Hotel and Hotel Rajesh serve a buffet meal in a platter, also known as the 'Gujarati thali'. However, eating at the hotels you stay is excessively costly.It is advisable to take meals at other restaurants as an outsider.Hotel Panorama,which is just behind the Govt 07:12, 17 October 2011 (EDT)122.182.28.114Bus Stand,offers good quality veg food at reasonable cost. Hotel Templeview - Vegetarian restaurant at old Mahabaleshwar for excellent parathas Rajasthani favorites. Hotel Woodland is another good option. Never go to the old mahabaleshwar for accommodation. It's better to stay near the bus stand for convenience. However, to enjoy the nature or the calmness of the forest then it is advisable to prefer old city. Also note that most lodges are reluctant to give accommodation to single males, due to some trouble that occurred previously. Hotel Rajesh, e mail: [email protected], . Centrally located pure vegetarian hotel with 70 centrally air conditioned rooms and 20 non airconditioned rooms. Parking, pool with waterfall, gym, childrens' play park with mini train. Ravine Hotel:. The only 3 star Hotel in Panchgani. Valley View: includes gym ,indoor swimming pool , garden with view of valley and good 3 star service. Surya Retreat : rooms pointing to valley, great view , open swimming pool. Hotel Dwaraka - Pure Veg: Reasonable budget hotel with amazing food. These hotels can cut a few more bucks from your wallet and these cost in range of Rs 3,000-5,000 per night, depending on season. A typical tour of Mahabaleshwar could be done in 3 days. Day 1 along Pratapgad fort direction. Day 2 along Arthur seat and Day 3 along Panchgani Mapro direction. This page was last edited on 25 November 2018, at 17:36.